IT WAS hats off to Woking’s teenagers as they lined up to collect their precious GCSE exam results last Thursday. Anticipation and trepidation were rife at schools across the borough as the youngsters discovered whether their hard work had paid off. Among those left smiling on the day was SJB’s James Mitchell, who dressed for the occasion in a fetching pink cowboy hat. Head of Year 11 at the Elmbridge Lane school, Andrew Clarke, saluted his pupils, who are now heading off to college or into work and training schemes. He said: “We’ve had an outstanding year, the best ever. A total of 99 per cent of students have achieved five or more A* to C grades, and 93 per cent had from A* to C grades in English and mathematics. “We are particularly proud of James Oliver, who achieved 100 per cent marks in both maths and further maths, one of only 24 students in the whole of the country who did so. 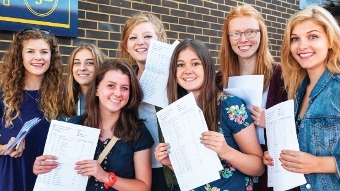 Exam officials revealed that 68.8 per cent of students nationally scored A* to C grades, up 0.7 per cent on last summer – despite a sharp fall in youngsters achieving their desired grade in English.